I have this love-hate relationship with February. It feels like such a short month and we have so many birthdays, Valentine’s Day, Black History, Presidents, great weather for field trips. So much to do. But somehow we have managed to make the most of our February and squeeze in a lot of learning. 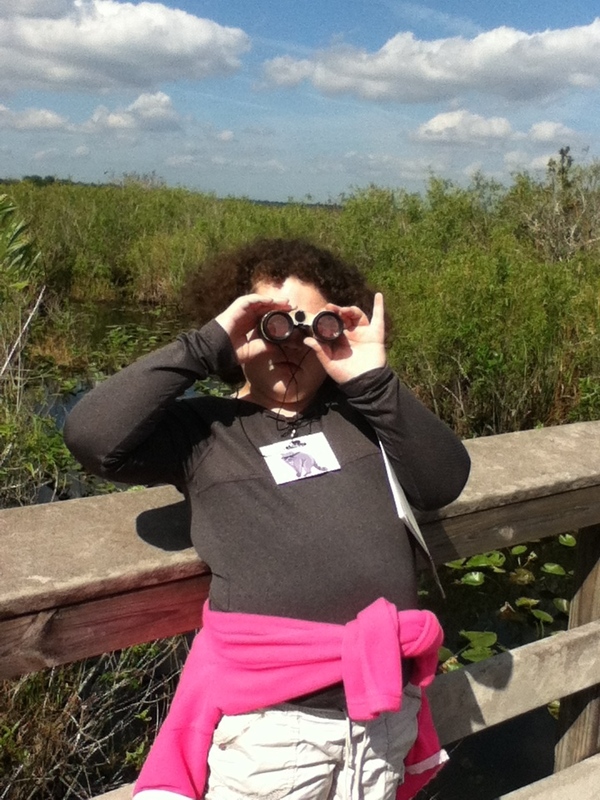 Kate observing the wildlife on the Anhinga Trail, Everglades National Park, 2/2015. Every year we return to Everglades National Park during the dry season and this year we had two visits, including a family camping trip over Valentine’s Day weekend. Our first visit was with the Returned Peace Corps Volunteers of South Florida. This is our third year participating as nature guides for local children from various non-profit organizations. My husband and I worked with a great group of kids from an after school program in Homestead. 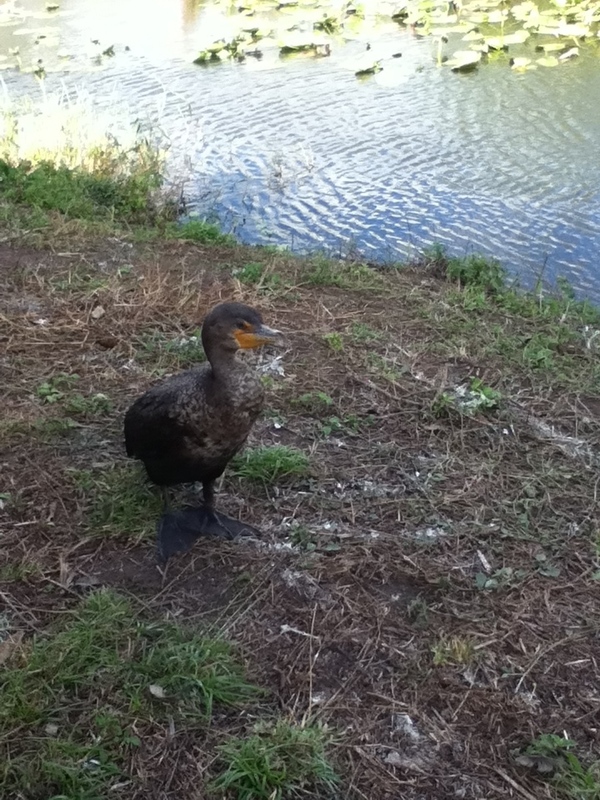 We spent most of our time on the Anhinga Trail, where we saw wildlife up close. It was the perfect way to conclude our novel, Alligator Crossing. 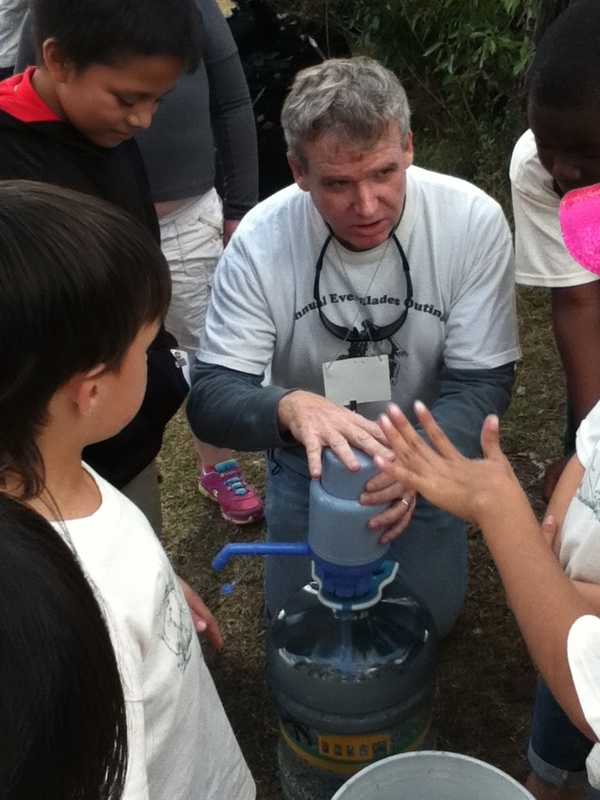 My husband teaching the kids about water. The best part of this month was the great weather for our morning walks. 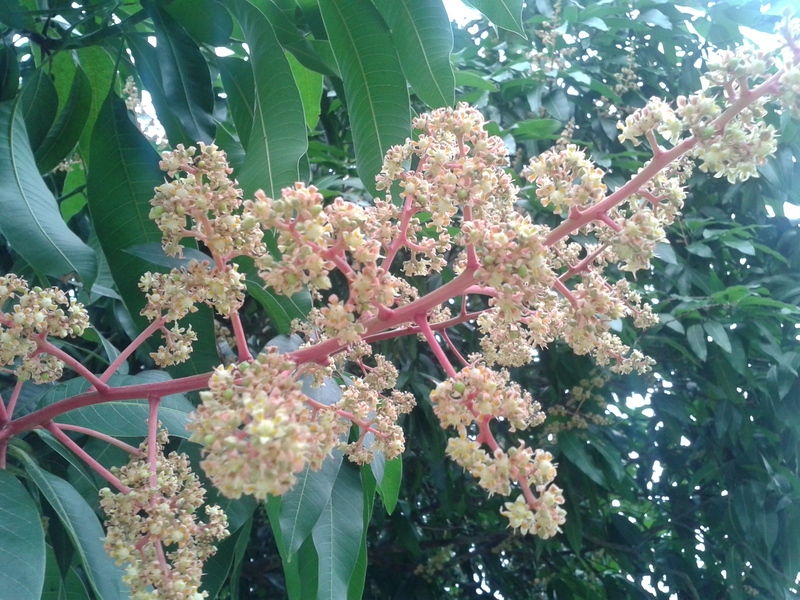 We observed the lovely buds on all the mango trees, including the one in our own backyard. (I never observed this before.) After learning about epiphytes (air plants) and seeing them on the trails at Everglades National Park, we started seeing them everyday on during our walks, too. Mango flowers in the South Florida winter. We discovered my new favorite tree, the Starburst tree and some mornings we were lucky enough to catch a glimpse of the green parrots that visit our neighborhood. We decided to put a bird feeder in our front tree, in hopes that from now on we might make some bird friends. Double-breasted cormorant, one of the wading birds at ENP. After completing our read aloud, Alligator Crossing we created a book project. Instead of a report we created a box which contained the elements of the book with words and pictures. We completed our Minecraft Homeschool Intro class. Ironically, she enjoyed the actual online class more than the build time on their server. Each week we learned about five amazing creatures, such as the coconut crab, red panda and the peacock mantis shrimp. We decided to skip the next session but will probably sign up again in the summer for another of their Intro level courses. We finally completed Level 1 of our AAR program. We actually started that program around this time last year. To celebrate we’re going to take a break before starting the next level (for me) and we’re going to visit the American Girl store in Miami (for Kate). In the meantime, we will work with an online reading program, Explode the Code. I need something that she can do more independently. I think AAR is great, but it’s teacher intensive and I need a break before moving to the next level. I’ve also heard great reviews on ETC so I purchased some of their workbooks to reinforce the learning at home off-line. Meet Addy from American Girl and Sweet Clara and the Freedom Quilt. Typically fourth grade is when Florida History is covered, so we will be be starting our Florida History and Geography Unit next month. We have a few great field trips planned for this unit and hope to visit St. Augustine some time this year, as well. When the month started I couldn’t imagine how much we would be learning, observing and doing together. I realized the most important reason why I chose to homeschool was because I wanted to see her love to learn. I’m trying to tune into what she’s excited about and make those our learning priorities and the result is fewer struggles and a happier kid and happier mom. The other day she told me, “Mom, we’re like besties”. I initially turned to homeschooling because I felt out of options, but it seems more and more like this was the best option for us. Being this our first year of homeschooling, I read every blog I could find to see how other homeschool moms plan and implement their school year. I was impressed and overwhelmed, especially when some are doing it for 3,4,5 even 8 kids. What I remembered from teaching high school, which has been useful now is that you plan goals for the year, quarterly or unit goals, and that guides the weeks and the day to day. When things go crazy you can go back on look at my big goals and ask myself is this activity/curriculum/lesson/etc. going to help us get to our big goal? Our big goal is reading proficiency. I want my student to gain the skills and the confidence that she needs to be a reader and a lifelong learner. So you have a great plan, that’s great. Now get ready to deal with interruptions, things going unexpectedly and things just not working. In the process we’re learning to make adjustments and keep our focus on the big goal. 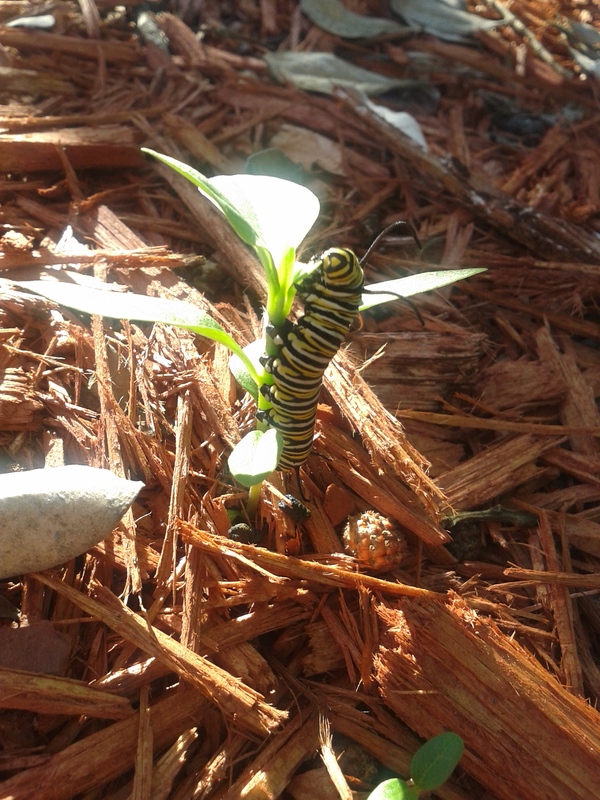 Look who we found while volunteering at the butterfly garden. 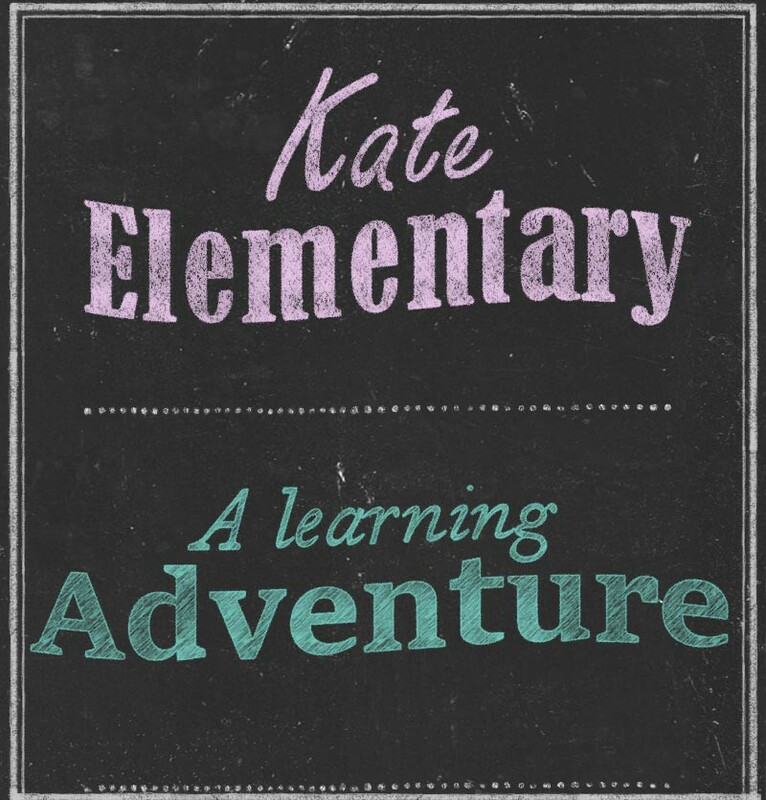 I had been feeling a bit stressed and overwhelmed when I started to see how many actual days we had left for school with the upcoming holidays and Kate’s medical appointments. Putting all that stress on myself didn’t help at all and didn’t change what is; we are on our own unique path. We are making time for the important things, the things that make homeschool special to us both. We won’t give up our morning walk. At first I wanted her to keep up the pace with me, exercise, run, get that heart rate going. Her idea of a walking was communing with the world. She would look around, pick up sticks, literally smell the flowers. So I slowed down. She loves the vegetable garden and has taken the initiative to water the plants as faithfully as she feeds Skippy. The minutes we spend together in the garden are full of wonder and optimism. Last week we also spent some time at the church’s butterfly garden, which challenges us to bring God’s beauty to others. Yes, we all have big goals for our struggling learners. We are so used to going into battle for them. We are always ready to charge ahead. I forget that there is strength in being still and knowing the deep connection to this moment and not letting it pass me by in order to check off a must-do list. I’m glad I have my kids to remind me of these, most important, things. 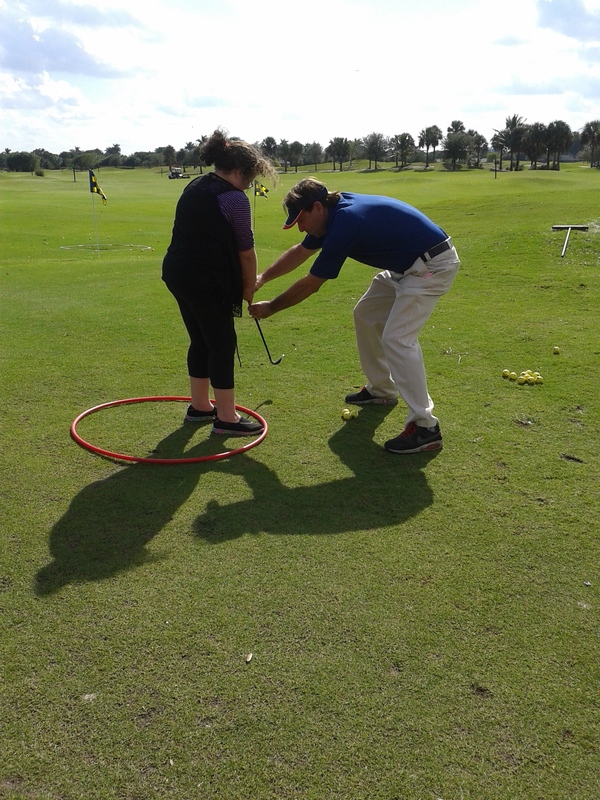 Below is a picture of Kate at her first golf lesson this past weekend. Thanks to the children’s hospital in our area, Joe Di Maggio Children’s Hospital, who organized this class for kids on or off cancer treatment, she is able to take free golf lessons with an amazing group of coaches. So far she loves it! What follows is a review of Time4learning, which was requested by a fellow homeschool mom. Read on if you’re interested in this curriculum. Time4learning.com offers a complete online homeschool curriculum for all grades, through high school, and all subjects. Parents can monitor kids’ progress and schedule learning activities to be completed daily, weekly, etc. I’m sure most parents would still need to supplement with science experiments, field trips, etc. Still, for $20/month if this is your main curriculum, it is a good deal. We used Time4learning in a very specific way; to supplement reading and for science curriculum. I was also planning to use certain sections of the social studies curriculum for when we covered Florida history. Most days that we worked together Kate was very happy to work on reading 15-20 minutes. I chose 1st grade reading level. That is a nice feature of Time4learning, being able to pick your child’s level in each subject. This way if they need extra review or need to move ahead you can easily make those adjustments. I thought the reading program was very interactive and offered her lots of practice with sounds, especially consonant blends, which she is struggling with for a while now. I liked that it was reinforcing what we were doing together in our reading lessons. However, after a few weeks it started to move to quickly. Within a few weeks it was introducing silent “e” or long vowel sounds which is something that our reading program doesn’t introduce until Level II. Their reading program didn’t provide our struggling reader enough repetition so after a while it got challenging and she lost interest, despite the animations. For science I chose 3rd grade level since she loves science and has always done well with science since it is so hands-on. However, because I chose that level because it would hold her attention, it was not animated and was at a very high reading level, which meant she couldn’t do it independently. It doesn’t have the feature where it could read the text to the student so it required one of us to be there, which made her hate it. She wanted to get into the fun stuff but instead it was very boring. We had to do too much work to make it interesting and even then it wasn’t enough. We all hated it and decided science is too much fun to do it this way. Bottom line: I had high expectations of Time4learning. We stayed with the program for almost six weeks and decided it wasn’t worth the $ for us. I couldn’t imagine using this as our main curriculum. This being our first year homeschooling we are still working on remediation, building confidence and independence. Never say never, some day it could be good for her, but there are too many skill that need to be developed before this would be a good fit for us. I’m glad we checked it out because it really is trial and error figuring out what works for our special needs learner. So for science we decided to try Magic School Bus Science Kits as our science curriculum. We got our first kit in the mail yesterday and are very excited to give it a try this month. I don’t think this curriculum is awful. I think it’s great if your child enjoys and can work independently and if you are not a fan of workbooks and more traditional learning. I can say it’s not for us right now.